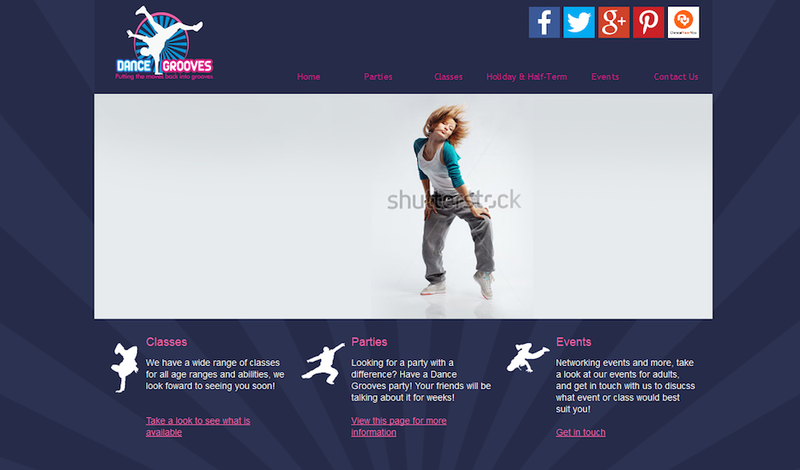 This week's website of the week goes to Dance Grooves, whose mission is to "put the moves back into grooves." 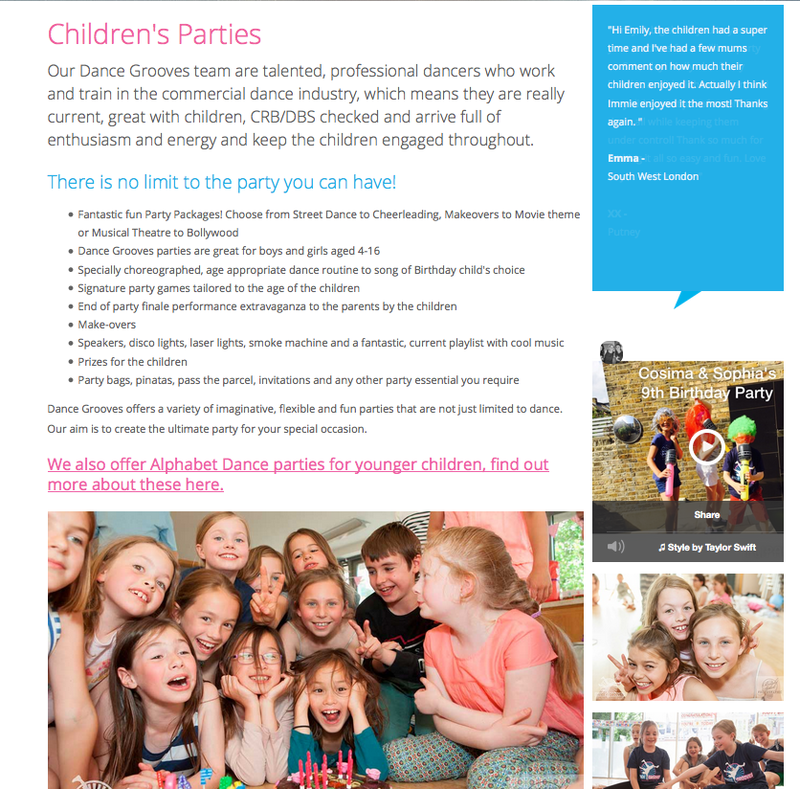 Dance Grooves team are talented, professional dancers who work and train in the commercial dance industry, which means they are really current, great with children, CRB/DBS checked and arrive full of enthusiasm and energy and keep the children engaged throughout. 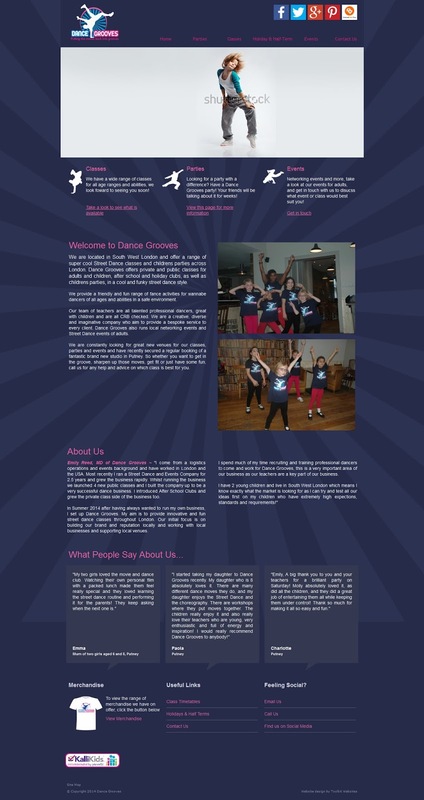 Dance Grooves were looking for a website that was in keeping with their existing logo branding. Something funky, bright, colourful and eye-catching. Project Manager Andy started off by creating a first draft that used the logo colours, a background texture and professional looking layout for the content. Initially the website used stock imagery, however the client soon got a professional photographer on board to capture some brilliant, action packed images that really work. When it comes to your business, if you're able to get professional photos done, it's a worthy investment. If you are selling a product or a service, sometimes just the visual imagery can sell it for you. Stock imagery is all well and good for generic industries such as tradesmen, financial and legal sectors etc, but the personal touch can really make a difference. Doing a U-turn on the initial design, Andy and the client worked together on a much more fresh and fun looking website. That's the ultimate reason we provide you with unlimited website design changes. (We'll work with you on the design until you're 100% happy with it.) Andy removed the background texture and by keeping it plain with a white backdrop, it means that the images really pop out at you. They are the main focus of each page, and the content is carefully crafted around them for the maximum impact. Looking through the pages, you can see that each one has been carefully thought out, depending on the subject matter. 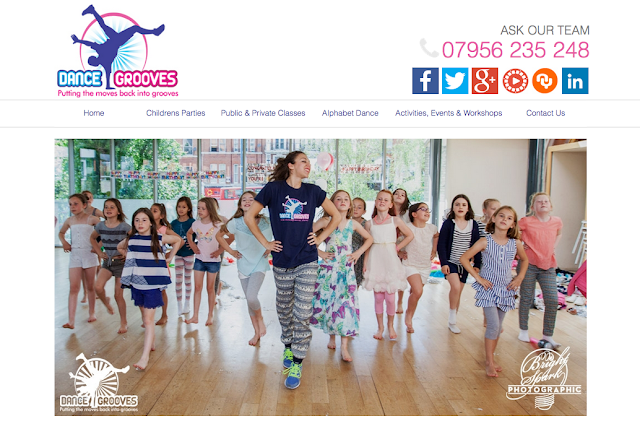 Class timetables are segregated and colour coded, videos are used to give an interactive insight into how Dance Grooves operates and the scrolling testimonials mean that you can read other peoples experiences whilst navigating the page. Dance Grooves knows that social media is the best marketing tool out there. Having their social media icons at the top of every page means that they are easy to access and one of the first things you see when you enter the site. The client even has a Twitter feed on the home page meaning that you can read all of the latest tweets without navigating away from the page. The client uses the contact page as a "last note" style page, where you can read about the Founder and about how Dance Grooves was created. It's finished beautifully with a black and white style photograph, and a handy contact form. The page also has a section where other companies are promoted on the site, with their logo and a link to their website. The client was pleased with the end result, saying that they loved the Flexibility, Design Ideas and Creativity of Toolkit Websites.